This season we have world-class soloists both on the pops side and with the classical series. 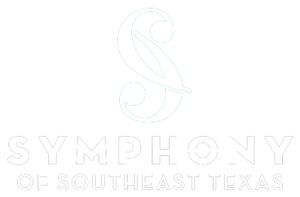 We will be sharing the stage with the outstanding percussionist Dame Evelyn Glennie, Tomoko Kanamaru on the piano, and all the way to the Men of Motown, the Symphony of Southeast Texas has something for you. This will be our biggest and best season as we celebrate 65 years of bringing great music to Beaumont and the surrounding communities. We will continue to offer great pops concerts. The first one will feature the movie music master John Williams and the second pops concert in March we will be swinging to the sounds of Motown. But we open our season in September with one of the great percussion soloists of our time, Dame Evelyn Glennie. In December, our Home for the Holidays concert will feature vocal soloist Connor Bogart singing holiday favorites that you are not going to want to miss. We will feature members of our orchestra in the Bach Brandenburg Concerto No. 2 and so much more this season. There is so much talent in Southeast Texas and we like to feature artists both local and international. This upcoming first classics concert is unique in several ways. We have not performed many pieces by living composers with the symphony here and Joseph Schwantner is a Pulitzer Prize-winning composer who taught music composition at Eastman School of Music when I was a student there. I have always loved his music and we are excited to share his music with the Golden Triangle community. Also joining us on our opening concert is world class percussion soloist Dame Evelyn Glennie. What makes her unique, besides her musical gifts, is that she has been able to create this amazing career all while being hearing impaired. You will forget about that when you hear her play on the Julie Rogers stage. This summer I spent time organizing and planning for the future. I love living down here and I do not even mind the heat or the hurricanes. There are such good people around here and I look forward to celebrating this 65th season with you all!